While the term selfie has exploded in recent years, the notion behind the digital photo phenomena has at least been around since this 1839 photo Robert Cornelius took of himself. 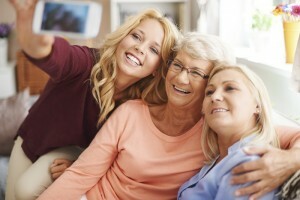 Taking selfies is not just for young, hip teenagers—it’s a practice that’s over 150 years old! So, if you’re ready to jump on the selfie train, then you’re in luck. We have a few tips for those who are seasoned selfie pros or for those who are just beginning. 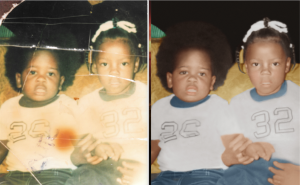 The before and after restoration of Fran’s photo with her brother. Fran Phoenix recently sent us a photo to restore that had a deeply emotional meaning and story behind it. Unfortunately, as sometimes happens as we get older, the two siblings started to grow apart. After high school, Fran went on to college, got married, and had children, while Marcus moved around a lot, never staying long in one place. Just when he seemed to be settling down with a good job in Atlanta, he took the family by surprise, telling them he was moving to San Diego. This was last November, and it was the last time his family has heard from him. Throughout the years, as staunch pro-business and consumer activists, occasionally something gets us steaming passionate. Today, it is about Ad blocking software. What is the difference between spreading fear to influence and circumscribe conversation, and hiding the instruments in which the media uses to keep the lights on? The new ad blocking software, to conceal content, is a threat analogous to what the photo industry faced, where an ochered-size of disruptive events lead to widespread turmoil as film transitioned to digital. Along with other products, the new Apple iOS 9 operating system installs advertisement blocking tools for iPhone users. This is similar to fast-forwarding television programs on your DVR to skip the ads. But, worse. Rather than seeing commercials flash by, each advertisement is vaporized. You will never see ads displayed on web sites. The business model for media outlets are mostly revenues from advertisements. All those blocked marketing messages equates to jobs and vital content being lost. Sure, not seeing ads is nice, but there is a real cost. Without revenues, your favorite media outlets and other web sites – powered by ad revenues – will vanish, just like the sponsored messages. The above video and news story on how to digitize photos with ScanMyPhotos.com was published by “Framework” by The Los Angeles Times, written by Robert Lachman. Organizing boxes of old snapshots is a daunting task. That must explain why so many of my snapshots have remained tucked away in one of our closets. It’s been about five years since I have worked on this project, and now, I am ready to work on it again and finish it up. Of course, with technology, the waiting game seems to have paid off. The cost of hard drive space keeps going down, and there are a lot of great options for cheap online storage like Google Photos, Apple’s iCloud, Dropbox and Amazon. The easiest part of the equation was organizing and packing up a box of photos for a return trip to ScanMyPhotos in Irvine. Their basic package costs $149 and includes scanning approximately 1,800 photos, which includes return shipping. It’s a simple and quick process.